There’s nothing like a clean house to make life feel more in order. And there is nothing like a “green clean”—achieved with natural house cleaner recipes—to leave you feeling good both inside and out. In the latest issue of Simply Gluten Free Magazine you’ll find an article I wrote on greener ways to tackle your Spring Cleaning. 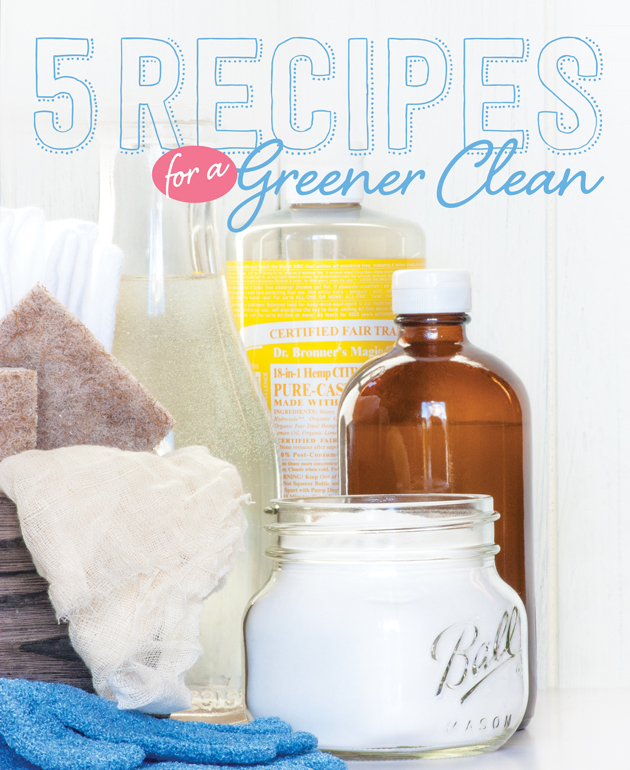 In it I share some of my favorite homemade, non-toxic house cleaner recipes and tips from one of my favorite cleaning experts Monica Leonard, founder of Molly’s Suds. The recipe for the lemony Easy Scrub smells good enough to eat—but I would refrain from doing so! My husband discovered that it also makes a fantastic hand scrub for greasy, grimy hands. I hope you enjoy the article and the recipes. I am so impressed with this post, Lexie. You did an incredible job with the article and I cannot wait to share it! I also cannot WAIT for that natural dye article to come out as well. Eeeeeee, I love the plant imprints on them too! I have a question after having read your spring cleaning article in Gluten Free. The article listed thyme oil as one of the anti-fungal, anti-viral, and anti-bacterial essential oils. Then I noticed that thyme oil is not included in any of the recipes for the homemade cleaning products/. What was the reason for its omission? The article is awesome!! Congrats and thanks for the recipes!! We are introducing natural cleaning product in our house and those will be the next we are making!! We have in our blog very easy and nourishing recipes, you are all welcome!! Thanks for posting. I am a strong believer of using natural green cleaning products.